Value-based pricing attempts to understand the value which your product creates for your customer in their environment. If we understand what value is created by our product, we can then capitalize on some of that value by setting the price for the product or service relative to how it benefits the customer. Value Based Pricing is one of the most sophisticated methods of pricing. I have seen value-based pricing impact a company’s pricing by tens of millions of dollars. Had that company used a cost-plus approach, they likely would have shared a much larger portion of the cost advantage with the customer instead of justifying their higher margins because of advanced technology. Value-based pricing takes quite a bit of time and effort. It also requires that you really understand the market you’re selling into. There is a lot of art to the science of value-based pricing… It’s not exact, and it’s up to the user to come up with how to determine the value of customer benefit derived from product features. I’ll be sharing lots of examples on how to do this for a hypothetical Saas company serving automotive repair shops. Value-based pricing attempts to understand the value which your product creates for your customer in their environment and capitalize on some of that value by setting the price for the product or service relative to how it benefits the customer. Value-based pricing starts with identifying the Next Best Alternative (NBA) which we’ll be comparing our product to. We’ll list unique product features and describe what value our product creates for the customer compare to the NBA. The art of science comes in when we calculate how much value each feature creates for the customer’s business. Then we estimate how much of that value we can capitalize on in our pricing negotiations. In this template, I have given a fairly complex example of value-based pricing along with a blank template. This is because there is more art than hard calculation to this and I wanted to provide as much of an example as possible. In this template, I don’t use the template norms of having orange cells where you’re supposed to enter data for the Next Best Alternative table. You are supposed to fill in the entire table, so indicating such seemed like overkill. In this approach, we will anchor our customer value with the best norm for the market you serve. This is known as a Next Best Alternative (NBA). The NBA is the product you are either competing with or the preceding technology you are trying to replace. The focus here needs to be on what is the most prevalent in the market that you’ll most likely be compared to in the marketplace. One thing to be sure of is to include consideration for what you’re NOT comparing yourself to. You might know a feature is worth $100 to the customer and try to charge $30 for it, but if your competition only charges $5 for the same item, you’re going to lose credibility. Take your time to think this through and get market data; you’ll likely learn a lot that is valuable later on during the Benefit Calculation phase. Here’s where we describe what our product features do better than the competition. In these first three columns, you should enter the feature, comparable feature in the NBA and describe the customer value created by the improved feature. In the example, you can see that the same feature has three distinct advantages. It is important to call these out separately because you will attempt to monetize each of the items which create customer value. Have a beer and use your creativity to discover all of the ways you can distinguish your product. In the cases where you have a disadvantage, you need to call those out as well. Be honest, you’re not doing yourself any favors by ignoring any serious detriment to your feature set. This is probably the most difficult part of Value-Based Pricing. This is where the creative science of Value-Based Pricing comes in. You need to have a real understanding of your customer’s operations in order to fully monetize or “financialize” the value you bring. In some cases, if you’re not sure, make a few guesses and share them with your sales team to discuss with various customers. First, you need to decide if it makes the most sense to evaluate value on a Monthly basis or on an Annual basis. Just about any services company will use Monthly, while manufacturing of lasting single purchase assets will likely use an Annual basis. Then start filling in what you can come up with. I’ve done this with a team of three to five people so that we can collaborate on how to calculate value. As you can see, some of your Benefits and Detriments will be one-time impacts and some will be periodic. You don’t necessarily have to do this in order, if you have an idea on how to do one of these start writing it down in the Calculation Logic column and figure out all the details as they come. This is a creative process, not a rigid one. In most pricing exercises it will not be possible to calculate the value of every single line. That’s OK. Things like “Brand Recognition” which often end up being listed have real value but are nearly impossible to measure. If you end up not being able to monetize a lot of your customer value created items, you probably need to spend more time understanding customer operations. OK, Great! you have an idea what value your product may create for your customers. Now, we have to estimate what they’d actually pay for it. Your customer has to get more value out of your product than they pay for it. They have to make money on the use of this product and their investment in training for and using your product. In the best case you’ll see 50% of the value you create land in your wallet. In many cases, it’ll be lower. That’s what the “Value Sharing” tab is for. First of all, you need to know what your customers’ industry standard is for payback on capital investments. Realistically, this will be 1 year. I’ve been in an industry which has a 7-year single purchase asses life and the expected payback period is 1.5 years. I’ve also seen a 30-year product life-cycle that uses 5 years. Anything less than the 5-7 year product lifetime will most likely be one year. 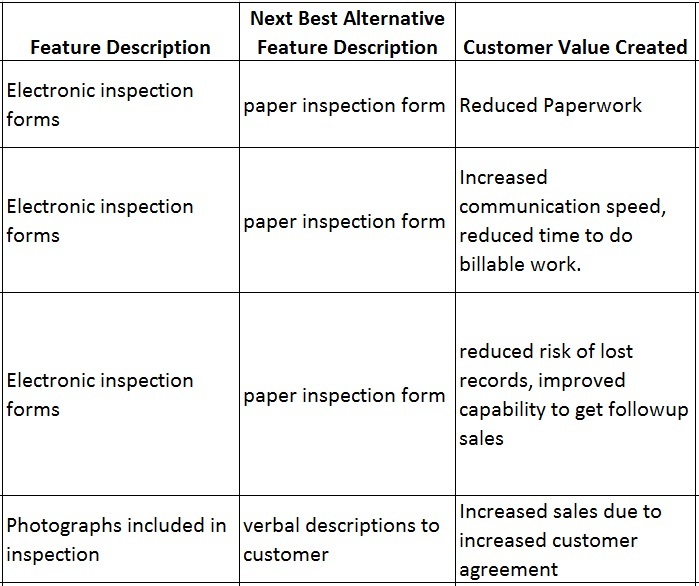 Estimate what the share of wallet could be on these customer value created features with your salespeople. In many cases, you’ll be in the 5-20% bucket. In some cases, you’ll be in the 50% bucket. I really wouldn’t expect to be above 50% unless you have a very knowledgeable salesperson who has the confidence and ability to get you that share. You should write down all of your justification to ensure that your sales team has as much information as possible for why you feel the price should be what it is. In some cases, you may be able to demonstrate a value that you will have no way to capitalize on, whether it’s perception or market priorities. Mark that down as a 0% share in that case. Now that you’ve completed this exercise, you should make sure you compare your new “Target Price” to the NBA and make sure you’re not going to be laughed out of the room. This may be a good time to add your new Value-Based Price to the Price Ladder used in Market Based Pricing to visualize where your product will land. Do you really have the ability to justify your price due to differentiation because of better features? Do you have the ability to convince your customers that your product will bring as much value as you think it will? Will the customer’s perception of your value be as high as you think it is?